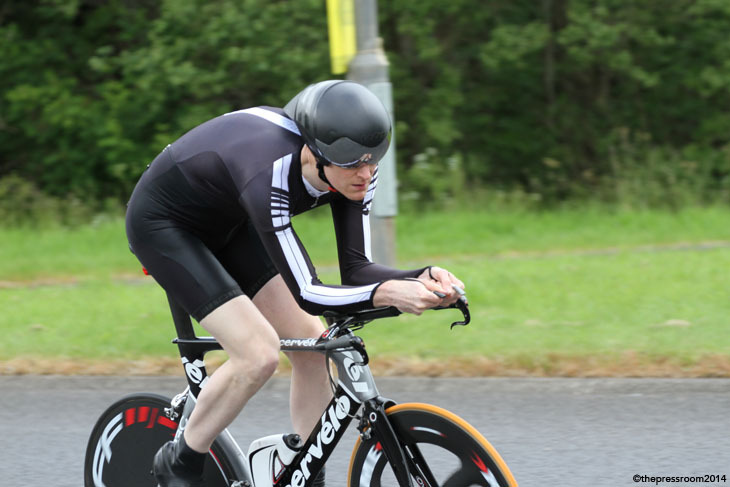 It’s a measure of the quality of Scottish time-trialling at the moment that the rider who came second in yesterday’s National 25 came home in a time of 52:25, a great time by anyone’s standards. But by doing so he only managed to cross the finish line 21 seconds ahead of the man who had started 2 minutes behind him. If you have to come second to anyone though then you couldn’t choose a better opponent than Iain Grant (www.Dooleys-Cycles.co.uk). 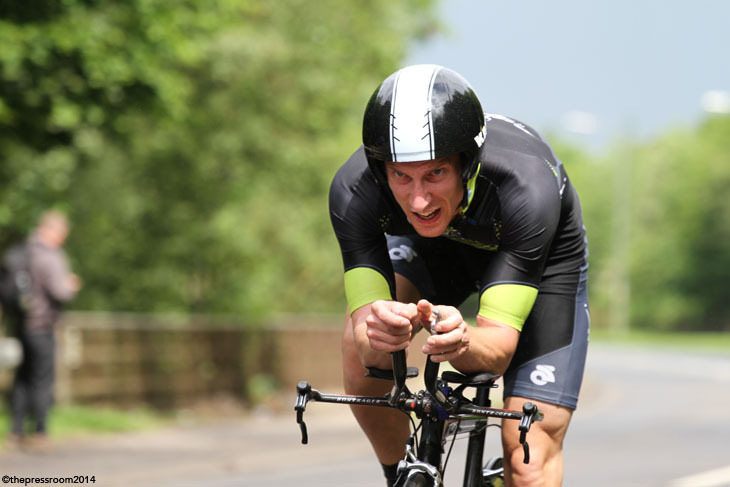 In a quality field that included most of the current standout time triallists in Scotland, Iain Grant stands head and shoulders above his competitors, and everyone knew he was the man to beat. 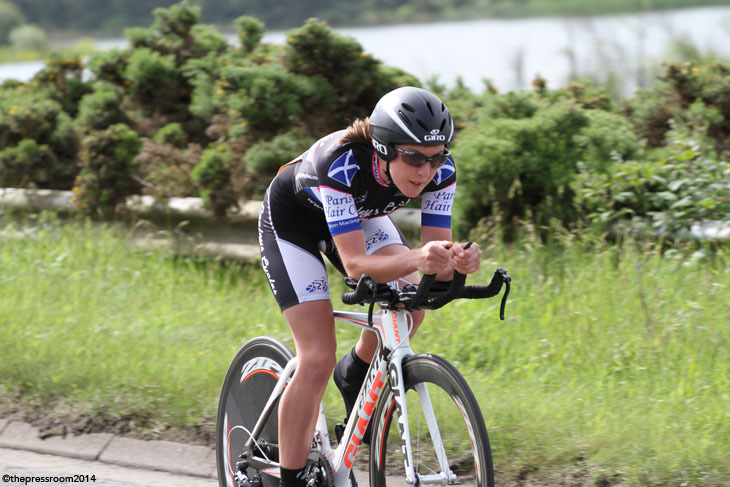 Having scorched the 10 Mile National title a few weeks before, he was in relaxed but determined fashion as he took on yesterday’s event based on the popular Irvine course and organised by Ayr Roads CC. On a day where intermittent showers had been forecast, the black rain clouds threatened at times but managed to skirt the race route for almost the entire time of the event. The early starters though definitely saw the best conditions with bright sunshine and a light southerly wind. 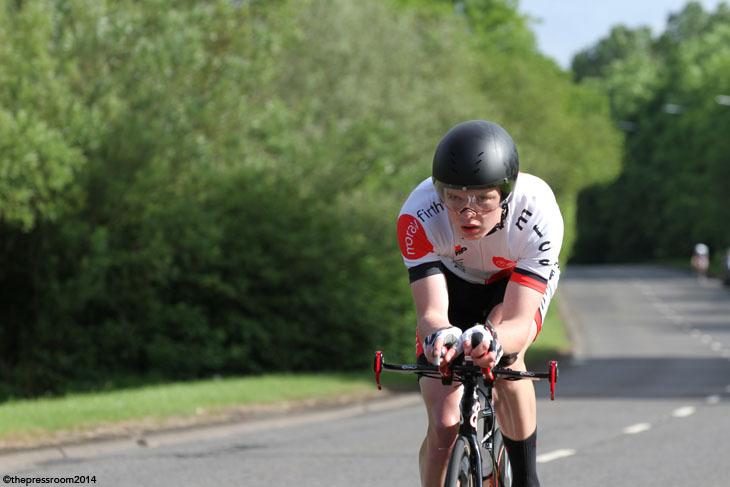 First rider to take to the course was Thomas Deas (Moray Firth CC) and he was to return in just under the hour in 59:39 followed 20 seconds later by the rider who had started three minutes after him and was to pick up second spot on the day, Sean Noon (Edinburgh RC). 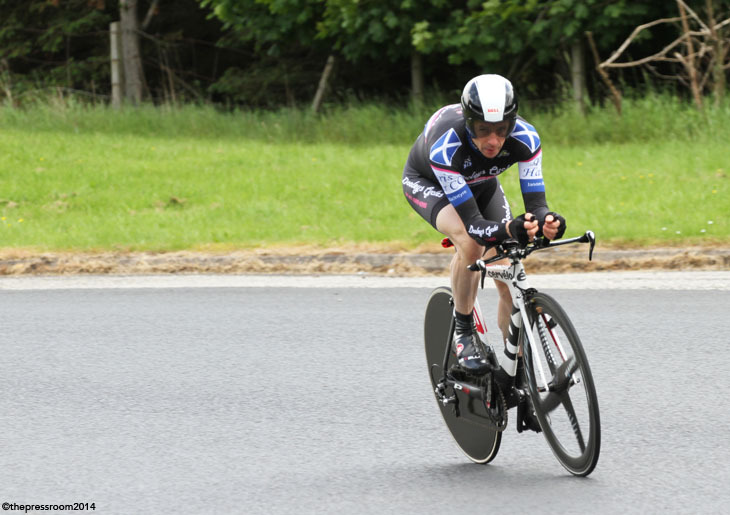 His time of 56:59 was looking good, but only for about a minute and a half as the last starter, Andy Brown (Glasgow Cycle Team) finished in a superb 56:03 to take the title. This was an excellent time and would go on to eclipse many of the senior riders later in the day. 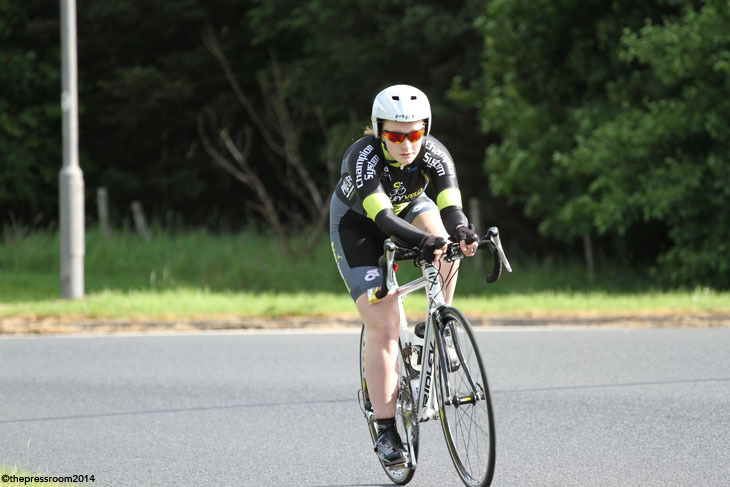 First woman away was Scottish Cycling’s own RDO Fiona Walker (Walkers CC) and she was followed by Laura Nicolson (Moray Firth CC). Nicolson was to post the best time of the early starting women but it was the fifth woman away from the starter, Anna Turvey (Tyneside Vagabonds CC), who really showed everyone a clean set of cleats as she passed all four of the women who had started ahead of her to return in a time of 56:11. This put her into first place but with some fast women still to finish. Along the way, Paisley Velo RT’s Amanda Dundas returned in 1:12:25 to take the Junior title and special mention to Emily Middleditch (Deeside Thistle CC) who came home in a time of 1:03:41 despite going off course at the first roundabout, an error that was to be repeated by several other riders throughout the day. It wasn’t a problem with signage which was more than up to the job but rather one of a roundabout with two exits almost all the way around to the right. Concentrating on the ride, especially just after the start, meant that some riders took the Paper-mill turnoff and while most noticed almost straight away, at least two headed off up the road only to return having been passed by riders starting behind them. Now it was the turn of the ceded women and Lynne Wardrop (Ayr Roads CC) came home in 1:01:59. 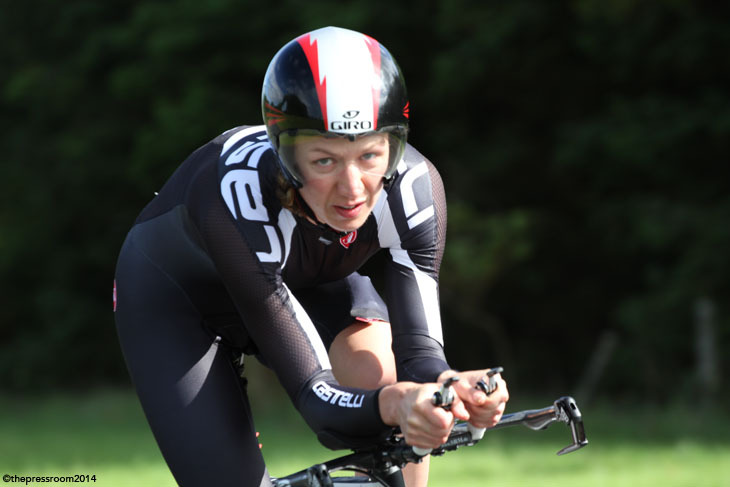 Sian Tovey (www.Dooleys-Cycles.co.uk) posted 1:01:02 and was followed in a minute and a half later by Toni McIntosh (Ayr Roads CC) in 1:00:29. This put McIntosh and Tovey into provisional 2nd and 3rd spots with only the last starting Lynsey Curran (www.Dooleys-Cycles.co.uk) to finish. However this was the way the standings stayed as word reached us that Curran had been unlucky and punctured and her race was over. So the title went to Anna Turvey with Toni McIntosh and Sian Tovey picking up silver and bronze. Ayr Roads CC took the team prize. Now it was the turn of the men and the weather had begun to cloud over with the breeze picking up a little. 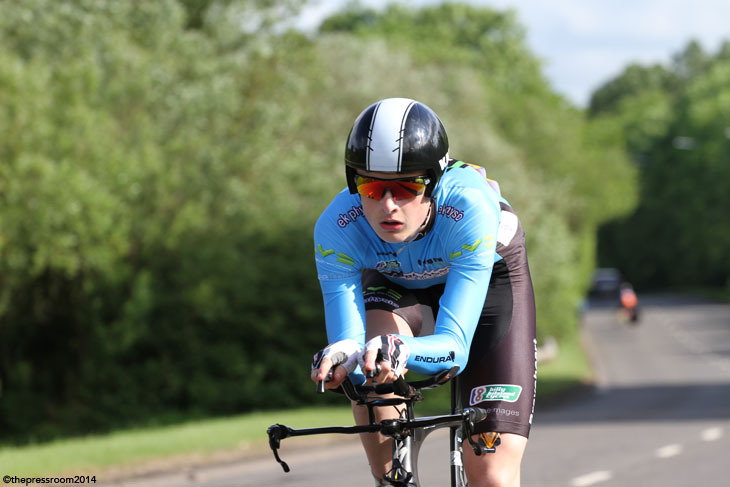 First rider away was Euan Pope (Glasgow Road Club) who was also the first rider to get inside the hour with 58:07. 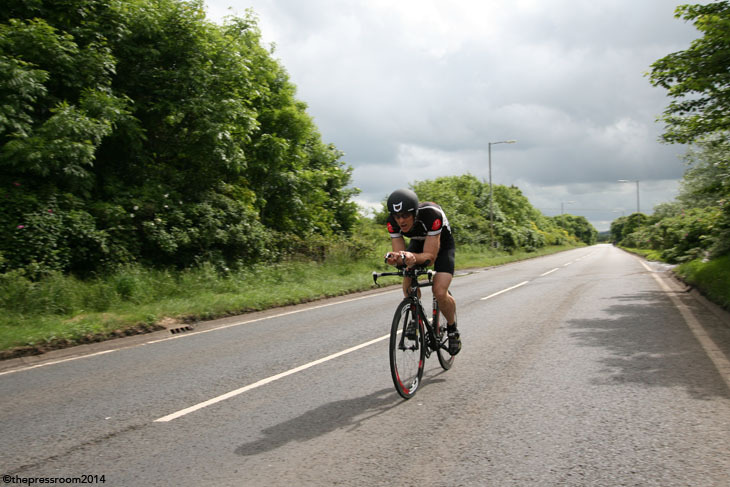 Rider times then hovered between 58’s and 1:01’s for the next hour until Gary Robson (Gala CC) took it down to 55:53, followed in short order by Ronnie Todd (Louden RC) in 55:29 and Lauri Peil (Edinburgh RC) in 56:00. 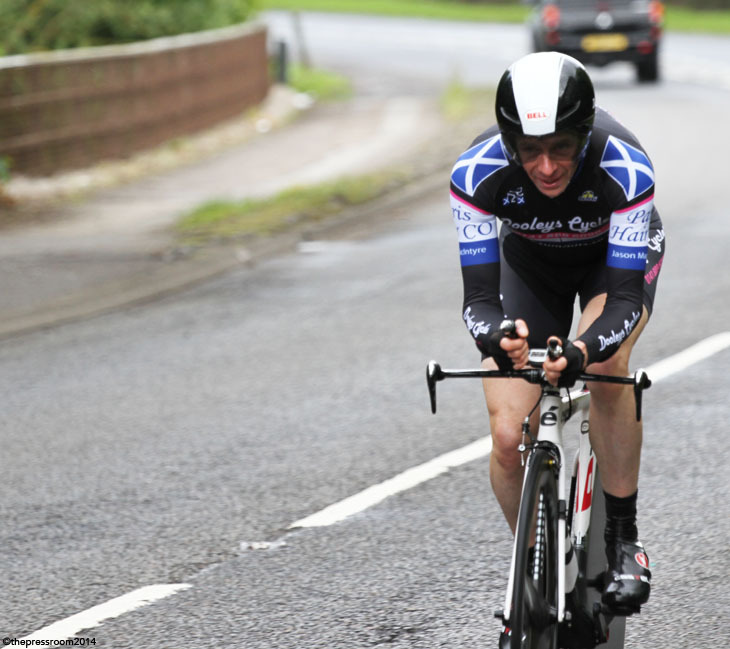 For the next 30 minutes, times began to slowly fall but it wasn’t until Alan Holmes (Johnstone Wheelers CC) finished in 53:52 that the timing sheet began to light up. Holmes’s time was enough to keep him in first spot until Chris Smart (Paisley Velo RT) finished and was good enough for 8th position overall. 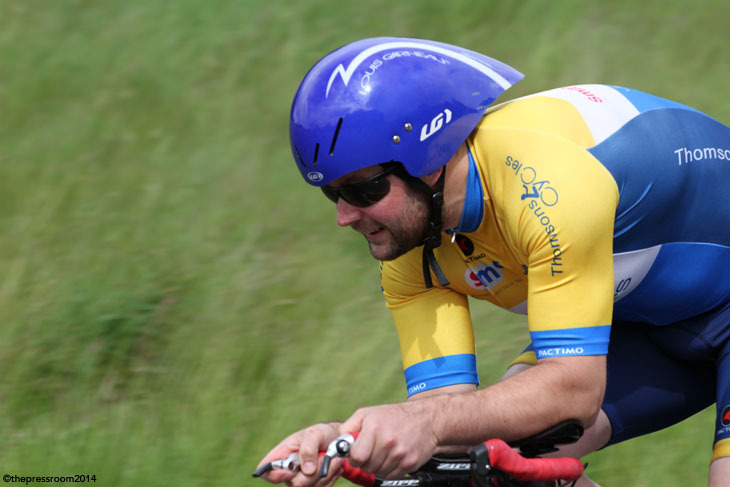 The winner of the Jason MacIntyre Memorial 10 this year, Smart finished in 52:50 to take the bronze medal overall. Now we were into the favourites and as the 10th from last man Steven Lawley (Rigmar Racers) set off the first shower hit but it was gone almost before it began. The wind was gusting by now and was difficult on the outward leg and the final run to the line. As the defending champion took the first roundabout he was looking, as ever, smooth and quietly determined. Grant always looks rock solid in his position and this belies the fact that he’s moving at speed. It was over to the finish line now to watch the last riders coming in and this is when the rain started. It didn’t last for long but was enough to dampen the roads. Humidity was high so as the shower eased into light drizzle the water began to evaporate almost as it was falling. The timekeepers were keeping dry under the overhanging bushes, as were the photographers and riders who had already finished but had come to cheer in their teammates. 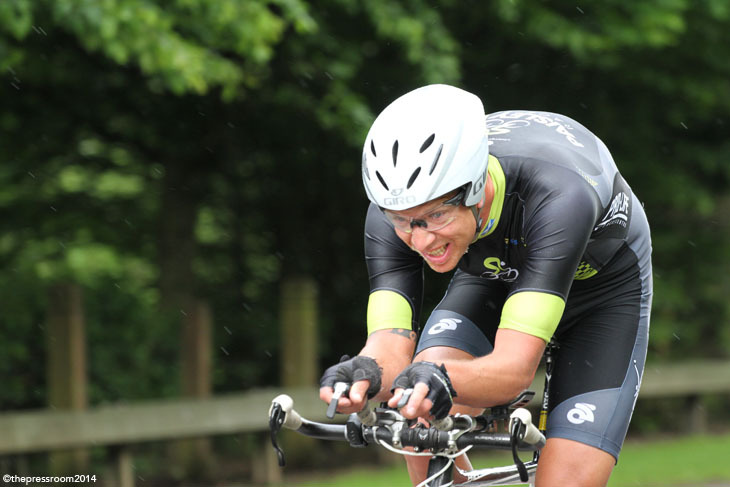 Alan Thomson (Sandy Wallace Cycles) was next to finish after Smart and posted a time of 53:17 which was good enough for 6th spot overall. Then it was Ben Peacock (Paisley Velo RT) who crossed the line in 53:48. The jury is still out on whether his flourishing facial hair is proving to be more or less aerodynamic but he took 7th position overall. As we’ve said before Arthur Doyle (www.Dooleys-Cycles.co.uk) is a big guy and seems to fold himself around his bike but he finished smoothly, gasping for air, to post 52:52 and take 4th spot on the day. Next home was Silas Goldsworthy (Sandy Wallace Cycles) who appears to be liking riding his bike again after the recent disappointment of not gaining selection for the Commonwealth Games and he even ‘buzzed’ a couple of the roadside photographers…not that they were complaining as it gave them great photographs. He finished in a time of 53:10 to take 5th overall. Now it was down to the last two men and as Peter Murdoch (Paisley Velo RT) approached the finish line he could be heard shouting at himself to release as much energy as he possibly could. He flashed past the line in 52:25 but it seemed that the photographers just had time to turn around as Grant was already on the bridge over the River Irvine and heading for the line. Leaving everything on the road he passed the timekeeper in 50:46 and was then seen to weave about on the road while he collected himself. This could have been because of the effort he’d expelled or because he was trying to stop his computer but we like to think it was the former. These times gave Grant and Murdoch Gold and Silver on the day and, as ever, Iain Grant was a popular winner back in the Event Headquarters for prize giving. The team prize went to www.Dooleys-Cycles.co.uk with Thomas Gordon combining with Grant and Doyle.